C. Agreement: The Agreement is between Suenos Azules LLC (also known as "Suenos Azules Marine Surveying and Consulting") and the Client and is constituted by a signed work agreement / survey order between the Surveyor representing Suenos AzulesLLC and the Client. It is assumed that the Client has understood the incorporating inter alia pertaining to these terms and conditions. B. When Suenos Azules LLC or the Surveyor gives an estimate or indication of price (in writing or orally) he will exercise skill and judgment in doing so. Such estimates are subject to the accuracy of the information supplied by the customer and hence estimates may be amended. G. A Client requiring captain and crew services can pay by cash, Paypal, Square or Wepay only. A deposit and a separate written agreement are required for these specific services. Payments can be made via our website through Paypal, Square or Google Wallet. All online deposits must be verified by Suenos Azules LLC before rendering services. D. The Client shall not sue any Delegate for any loss or damage of any nature suffered by The Client and connected with performance of the Agreement. The Clients sole remedy shall be against Suenos Azules LLC under this clause for no more than the value of the survey, inspection or service. F. If Suenos Azules LLC or any Delegate does incur third party liability of any nature whatsoever arising out of or connected with performance of the Agreement then (subject to the clause below) the Client shall indemnify Suenos Azules LLC, or such Delegate against such third party liability and costs and expenses relating thereto, and this indemnity shall apply even if the third party claim was based on negligence. Further to the extent that Suenos Azules LLC may have indemnified any Delegate against such third party liability, cost or expenses (which Suenos Azules LLCat their sole discretion shall be entitled to do) then The Client shall thereupon be liable to indemnify Suenos Azules LLC accordingly. I. Neither party shall be liable to the other for indirect or consequential damages resulting from or arising out of the Agreement including but not limited to loss of use of property, loss of profits, loss of product or business interruption. 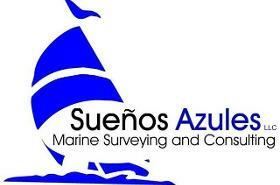 C. The Suenos Azules Marine Surveying and Consulting logo is a trademark of Suenos AzulesLLC and is not to be used by any other person or entity except by express written consent of Suenos Azules LLC. D. "Infrared Training Center," "ITC," and "Flir" logos and designs are registered trademarks of FlirSystems Incorporated and are used on this website and in proprietary reporting with exclusive permission from Flir Systems Incorporated. A. Surveys, inspections, and other services will be conducted on a specified date with the Client's or Client 's Agent signed agreement and will include an inspection of the vessel, vessel’s structure, systems and equipment with inspection in dry-dock and sea trial (if requested by the Client). The purpose of this survey will be to determine the condition and approximate market value of the above vessel. The vessel will be surveyed without removal of parts to include fittings, plumbing, wire casings, permanently fastened carpeting, panels, partitions, sheathing, joiner work, deck covering, ground tackle or any other permanently or semi-permanently installed items. Locked or otherwise inaccessible areas will prevent inspection. The total charge for the surveyor service will be agreed upon by the Surveyor and the Client which may or may not include a deposit. Charges may include travel and other surveyor expenses, but does not include the costs of docking and/or undocking of the vessel. Suenos Azules LLC (also known as, "Suenos Azules Marine Surveying and Consulting") reserves the right to assess additional hourly rate surcharges if the survey process is slowed by circumstances beyond the control of the surveyor. Such as a vessel not properly prepared for survey as per instructions, third party contractors not hired by Suenos AzulesMarine Surveying and Consulting, vessel equipment located elsewhere, a vessel in poor or unsafe condition, etc. Customers have the option to pay by cash, check, money order or make payments on our website at: www.SuenosAzules.com through Paypal or Wepay. All online payments must be verified by Suenos Azules Marine Surveying and Consulting before rendering services. All check and money orders must be made out to "Suenos Azules" Payment is due before or on the day of the survey. Payment in full must be received before the survey report is released. Other payments for services may require a fee deposit. Any outstanding amounts of agreed services (between the Client and Surveyor) that are owed from the client are payable within 30 days of the receipt of invoice. Any overpayment will be refunded to the Client either on the day of the survey or within two weeks if by mail. The written report will consist of vessel specifications, general comments, a list of operational equipment, and a list of extra equipment. Also, specific remarks and recommendations will be made concerning the vessel in dry-dock, the exterior (including spars and rigging, if applicable), interior, bilge areas, electronics, safety equipment and deficiencies, as well as a trial run with results and comments. With the signing of this Work Agreement / Survey Order, the Client, Client's agent or person requesting this survey or service agrees to the charges as set forth above and to the provisions as set forth in the written survey report. Survey results are intended to represent the physical condition of the vessel only on the day of the survey, based on the facts presented and discovered, in the opinion of the surveyor. This report will not specify or imply any type of warranty of the vessel or the vessel's equipment. Additionally, the survey will not address the vessel's stability characteristics, inherent defects or the internal condition of machinery. Operation of AC and DC electrical systems will be conducted only to verify the basic operation of those systems as specifically listed in the report. No reference or information contained in the report should be construed to indicate compliance of any equipment to include propulsion system, auxiliary machinery, and electronics with manufacturers’ published specifications. Comments concerning cosmetics are made at the discretion of the Surveyor and should be considered the surveyor's opinion. In the event that it becomes necessary to bring legal action to enforce the payment provisions of this agreement, the Client shall be responsible for paying the reasonable collection costs of such action including attorney fees and other related costs. Should the Client, for any reason, seek to bring legal action against the Surveyor or his/her company, the total of any damages that may be awarded will be limited to the charge for the survey as listed above. The Client shall have the right to cancel this agreement up to two calendar days prior to the date of the survey. Cancellation after this date will require the Client to pay Suenos Azules Marine Survey and Consulting the minimum daily surveyor fee of $300.00 USD. B. The Surveyor is contracted by and works exclusively for the Client. The provided report is not transferable to any other persons or entities and the information distributed is for the use of this Client only. This agreement specifically excludes any liability of Suenos Azules LLC or the attending surveyor to any third party. The Surveyor represents and warrants that he has the experience and prerequisites to accept the contract and that he is free of prejudice. The Surveyor agrees to perform a reasonable evaluation of all vessel parts and equipment, where accessible, and to provide a report including a list of findings and recommendations for the correction of defects. Findings and Recommendations are divided into three categories. (A) Safety Deficiencies; which may be printed in red, (B) Other Deficiencies Needing Attention; which may be printed in green, and (C) Surveyors Notes and Observation; which may be printed in blue. Inspections are conducted based upon the guidelines of The Society of Accredited Marine Surveyors (SAMS), recommended standards of the American Boat and Yacht Council (ABYC), requirements of the Code of Federal Regulations (CFR Title 33 and 46), and 1972 COLREGS navigation rules. The Client understands that if the service provided is a marine inspection that is localized to an area of the vessel to confirm repairs, refits, modifications or damage, that the survey / inspection report is limited to the area of inspection only and not to other parts or sections of the vessel. When provided, fair market valuations are based on comparison research using similar vessel types, as possible, and the experience of the Surveyor. The Surveyor shall make reasonable effort to provide an educated and unbiased opinion. The Client contracting with the Surveyor is responsible for having researched the appropriate vessel type and surveyor for his or her needs and with the understanding that the results of the survey and the survey report are but additional tools for his or her decision making regarding a prospective vessel. The Surveyor does not opine on the suitability of the vessel for the buyer's and/or the Client's needs or other factors that may be important to the buyer or Client's decision making but which are outside of the scope of survey. The Client shall understand that the marine surveying profession is not licensed or regulated by any government agency, that the established methods are by observation and non-destructive testing, and that no warrantee is implied in discussions, written or oral, about the lifespan or length of service remaining of any parts, gear, machinery or equipment, including hulls and decks. The buyer or Client must sign a contract or agreement with the Surveyor delimiting the services to be provided. Accepting the survey report, and paying the agreed fee, will constitute acceptance of the contract set forth here in lieu of a previously signed written agreement. The Client should facilitate the actual survey by insuring the following are complete before the survey date: Emptying lockers, compartments and bilges for inspection, explanation of the use of unfamiliar equipment, non-standard installations, and proper operation of all machinery. Disclosure of any previous major repairs or structural changes, providing documentation as to these changes, and providing all the chain of ownership legal documents; this is especially important with vessels not documented in the United States. The seller or his designate will operate the vessel prior to, during or post survey and while on the sea trials. The purpose of a marine survey is to provide the prospective buyer or Client with a reasoned opinion of the condition and value of the vessel to be surveyed. Destructive testing, cost estimating, scientific calculations, prognosis for osmotic blistering, and determining the extent of hydrolysis or laminate disbonding (delamination) are beyond the scope of a marine survey and require specialized examiners. A marine survey is an opinion only. A marine survey does not provide a warranty or guarantee of any kind. In no event, shall any liability exceed the cost charged for the survey. Marine surveying is not an exact science and is not regulated nor licensed by any governmental agency. It is neither cost effective nor practical to list every observable cosmetic deficiency. It is not possible to guarantee discovery of hidden flaws. Often, flaws become apparent only after a change in environment, modification of equipment or change in usage. The Surveyor is not a guarantor or insurer of the vessel. Destructive or laboratory testing, estimating costs of repairs, and the unobservable function of machinery and electronics are beyond the scope of the survey and require specialists. Unless otherwise agreed, mastheads, rigging above deck level, sails, electronics beyond power up, machinery beyond operation, engines beyond starting and running, and complex electrical installations are excluded from inspection. Errors and omissions are limited to the terms of this contract. Failure to list obvious wear and tear that is within the observable scope of the buyer or Client does not constitute omission nor does subsequent discovery of defects that are beyond the limitations of a marine survey as described here, constitute error. Other limitations, as specified in the report's "Scope of Survey," but not mentioned here, are also agreed to by acceptance. Disputes arising from this contract must be adjudicated in West Palm Beach, Florida USA. Any damages arising out of this contract in connection with the survey that is the subject of this contract, and the liability of the Surveyor are limited to the fees paid by the buyer or Client to the Surveyor in connection with this contract, less any expenditures by the Surveyor for oil samples, consultant fees, and other out-of-pocket expenses. In the event of litigation, the prevailing party shall be entitled to attorney's fees and costs. This contract constitutes the agreement of the parties regarding the vessel mentioned above. Prior to survey, the Client will have read all four pages of the agreement and understand and agree to the above conditions and stipulations.